Don't have time to go to the zoo or on a safari? 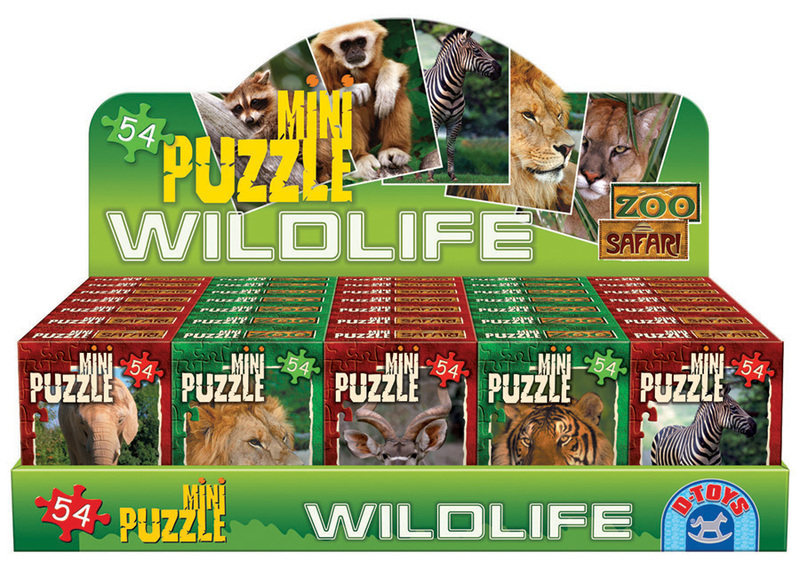 Collect all eight Wildlife mini puzzles! Each mini puzzle includes 54 pieces and is a finished size of 4.5" x 6.25". Fun wildlife images include gorilla, elephant, lion, giraffe, tiger, zebra, kudu, and a monkey. A great travel companion, fun after school activity, or race against your friends to see who completes their mini puzzle first! Click View Larger for all eight wildlife animals. *Retailers - these are mixed pre-packed displays with 40 puzzles in eight different images. Quantity of each image may vary by case pack display. Case Pack Prepack of 40 Width 2.5"
Item # DT-901 Weight 0.06 lbs.